National Digital Archives of Japanese American Military Service – Page 2 – To educate and inspire character and equality through the virtue and valor of our World War II American veterans of Japanese ancestry. Yesterday, the Go For Broke archives team attended the National Diversities in Libraries Conference (NDLC) at UCLA to present about our ongoing project. We titled our presentation “Faster Access or Perfect Metadata? The Balance in Indexing and Cataloging Oral Histories.” In our presentation, we first gave a background about the history behind the Nisei soldiers’ experience during World War II. 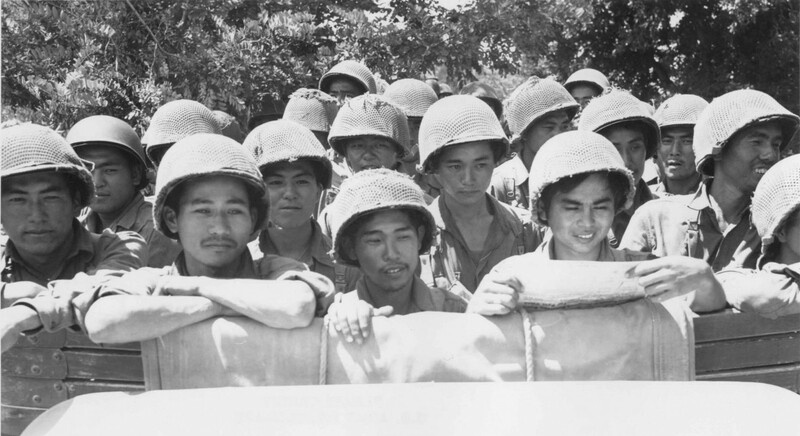 We then described our approach in indexing and cataloging the oral history narratives provided by Nisei soldiers. We also presented the challenges that we faced along the way in creating our controlled vocabulary index. We received very positive feedback from our audience. We were surprised to hear that some of the viewers were already aware of the work that we were doing with the Hanashi Oral History Project and the National Digital Archives of Japanese American Military Service (NDAJAMS). We also received comments about how our passion for this project and the Nisei story was clearly evident during our presentation. It is comments like these that put our efforts into perspective and encourage us to continue our work towards spreading this story to a much wider audience. One viewer, who we found out was from Japan, approached us after our presentation to tell us that she was surprised to learn about the Nisei soldier experience. She then assured us she would share our project and the story of the Nisei soldiers with her friends. She was so intrigued about how powerful the Nisei story is and how important it is for others to know about their experience. Another viewer even shared updates about our presentation via social media (Twitter). Being such a small cultural heritage organization, it was incredible to see how well of a reception we received upon presenting our project. We hope to continue to inspire others to learn more about the Nisei soldier experience during World War II. Since I began my time with Go For Broke National Education Center, one of the exciting projects I have been able to take on is processing the Hiroshi Sugiyama collection. This opportunity came about as I stumbled upon a picture from Sugiyama’s collection and proceeded to briefly research his story and publish it in this blog. Items from the Hiroshi Sugiyama collection processed by Gavin Do. The following items include (left to right): Sugiyama’s Purple Heart citation; leather portfolio with life insurance documents; and monogrammed ring. Where did this collection come from? How did GFBNEC acquire this collection? Who are the people represented in these collections? Where are the locations that are represented in these collections? What are the dates of events or items represented in these collections? Does this fit into the Nisei soldier narrative that we are attempting to tell? There are many more questions that we have had to ask as a staff regarding our collections. Luckily, our questions were met with answers in the case of the Hiroshi Sugiyama collection. Archivists use the term provenance in order to describe where items or a collection has been or come from in its past, starting from the origin with the creator to its current whereabouts (and everything in between). For the Hiroshi Sugiyama collection, we are initially unaware of the provenance of the collection other than that many of the items came from Hiroshi himself. We were in luck, however, because our archives staff was able to find information regarding the provenance of the Sugiyama collection. Staff found a copy Torch from 2006 that publicized the purchase of the Hiroshi Sugiyama collection from an auction. While that explained where the collection came from, the collection still needed to be physically processed. Upon doing that, we realized that a number of items were missing from the collection. Upon reviewing the paperwork, however, we came to the conclusion that the missing items were not missing, but actually on loan to the Museum of Tolerance in Los Angeles. Wells, Annie –– – 131981.ME.1220.stamp Press conference at The Museum of Tolerance for support of Japanese American WWII vets to get a US postage stamp in their honor. Don Seki, of the 100th Infantry Battalion, stands in front of a display case at the museum that contains artifacts of Hiroshi Sugiyama, a medic in the US Army who earned a Purple Heart, a Bronze Star and a Good Conduct medal. Sugiyama was killed while administering first aid to a wounded soldier near Tendola, Italy.photo by Annie Wells 12/20/07. Courtesy of Getty Images. Editorial #563981693. Part of LA Times Collection. We have since contacted the Museum of Tolerance and had very pleasant conversations with them regarding continued collaboration with the Hiroshi Sugiyama Collection. The purpose of this blog post is multifaceted. For one, I always love bringing more attention to the Hiroshi Sugiyama Collection. I think it is a collection full of history, context, and research value that tells the story of a brave soldier who made the ultimate sacrifice. Secondly, I think that it is important that as an archives staff, we explain and display what we do and how we do it. Archives is admittedly a very obscure and abstract field of work, and we want to be transparent with the community about our developments. We recognize that Go For Broke is an organization that has a team of outstanding volunteers and supporters, and we rely on all of you to survive. The supporters need to be kept in the loop. That being said, we as an archives staff want to express our excitement that items from the Hiroshi Sugiyama collection are on exhibit at the Museum of Tolerance. Their exposure and traffic will allow the collection to tell the story of Hiroshi Sugiyama, and by extension, the story of the Nisei soldier. Check out the “Defining Courage” Exhibition! Have you seen our new exhibition? In late May, we opened The Defining Courage Experience, a hands-on and participatory learning center in the heart of Los Angeles’ Little Tokyo historic district. The exhibition explores the concept of courage through the lives of the young Japanese Americans of World War II, and asks modern visitors to act with similar courage in their own lives. The exhibition is one-of-a-kind in its dynamic, hands-on, and experience-based approach, engaging visitors through participatory learning experiences. These experiences teach the history of the Japanese American World War II story and its relevance to our lives today. This isn’t your typical history museum! Throughout the exhibition, visitors get to “meet” hundreds of young Japanese American men and women from the World War II era. Our archivists worked hard to find photographs, quotes, and oral history clips from throughout our entire collection, and these are powerfully presented in the exhibits and hands-on activities. Countless hours were spent by our archivists, and the result is an exhibition centered around the real first-person stories of hundreds of young WWII soldiers and their contemporaries. In interactive high-tech and low-tech exhibits, visitors feel that they really “meet” these young men and women, discovering their courage first-hand as they experience our exhibition. Visitors can even make their own mini-documentaries, using our vast collection of historic photos and oral history videos! Our exhibition is one way that we bring our archives out of the “old dusty boxes” and into the public knowledge. Our archivists are experts at discovering the most powerful, historic, and important pieces in our collection, and they love using numerous methods to showcase these to the public. It is through their hard work that our organization raises awareness of the Nisei soldier story and its continued relevance to our world today. If you haven’t stopped by our exhibition yet, pop in and see the fruit of their labors! As I reflect on this Independence Day weekend, I hope sharing this brief segment from Kim Ida Surh’s oral history interview will resonate and inspire others to reflect on the meaning of patriotism and freedom as it inspired me. Surh was born in Nogales, Arizona in 1915, grew up in Los Angeles, California and volunteered as an Army nurse in World War Two. Surh explains what patriotism and freedom meant to her and why she felt compelled to volunteer. While cataloging records for the interviewees from the Hanashi Oral History Project, I came across a very interesting individual by the name of Wataru Misaka. He is not only known for being a Military Intelligence Service veteran who participated in the occupation of Japan, but also for being the first Japanese American to be drafted into the NBA (National Basketball Association). Wataru “Wat” Misaka was born in Ogden, Utah to two Issei parents from Hiroshima Prefecture in Japan. At a young age, Wat took an interest in sports, playing on various sports teams starting in junior high school, and continuing into high school and college. Luckily, he and his family were not forcibly removed into an incarceration camp after the implementation of Executive Order 9066, so he was able to continue his education at Weber Junior College (now Weber State University) and later at the University of Utah. While attending his first year at the University of Utah in 1944, he helped the basketball team win the NCAA and NIT (National Invitational Tournament) Championship. As soon as he returned home from New York, Wat received his draft notice and reported to Fort Douglas, Utah for his induction into the US Army. He completed his basic training at Fort McClellan, Alabama, and was reassigned to military language training at Camp Savage, and later, Fort Snelling, Minnesota. After completing language training, Wat was shipped to the Philippines, then to Tokyo where he was assigned as an interviewer for the United States Strategic Bombing Survey (USSBS) team. Wat returned to the United States after receiving his discharge in 1946, where he continued his studies and re-joined the basketball team at the University of Utah. A year later, he helped his team win the NIT (National Invitation Tournament) Championship in New York. Back then, the National Invitation Tournament was the top college basketball tournament that a college team could qualify to compete in (equivalent to the NCAA college tournament today). Our new exhibition, which opens to the public on May 28 in Los Angeles, features dynamic hands-on and participatory activities. These exhibits use hundreds of photos and video clips from our collections, and it is the hard work of archivists that has made this possible. Go For Broke National Education Center presents the “Defining Courage” exhibition, scheduled to open on Saturday, May 28, 2016. One activity, called Media Maker, allows visitors to create their own mini-documentaries about the Japanese American World War II experience. On digital touch-screens, visitors are given libraries of historical photographs, videos, documents, quotes, and clips from our Hanashi oral history collection. They use these assets to create their own unique 3-5 minute video, which they then share with the world via social media. Another exhibit, called Piece It Together, lets visitors step into the shoes of young Japanese Americans during the World War II era. Visitors are forced to make decisions, such as “Will I join the military or will I resist the draft?,” and their decisions define the circumstances that they face and the people whom they meet. This computer-based activity uses hundreds of historic photographs, videos, and documents from our archival collections. These are just two of the many dynamic activities that make up our new exhibition. Visitors will literally see thousands of images and film resources, thanks to the hard work of our archivists. The past will be brought to life through these photographs and videos, and thousands of young adults will learn the courage, virtues, sacrifices, and patriotism of the Japanese Americans who lived during the tumultuous years of World War II. Come to visit our new exhibition when it opens on Saturday May 28, and if you have the chance to see an archivist, make sure to thank them for all that they’ve done to make this experience possible! Visit www.goforbroke.org for more information about the exhibition and its public opening. Can history truly be relevant today? Can things that happened seventy years ago teach us anything? Or is the study of history simply boring at worst and entertaining storytelling at best? Sure, stories from the past can be fascinating, enthralling, and emotional, but is history only like your favorite sitcom – entertainment with no impact to the world today? The late Senator Daniel Inouye didn’t think so. The quote above comes from our oral history interview of the war-hero-turned-statesman, preserved in our Hanashi archives. For Senator Inouye, history teaches lessons for today. The stories and accounts of the past must be used to avoid repeating mistakes in the present. Since hindsight is 20-20, the modern generation can look back honestly on the triumphs and the mistakes of past generations, and work diligently to repeat the former and avoid the latter. History gives us the “playbook,” so to speak, of which actions to follow and which to prevent. That is why our Hanashi oral history archives is so invaluable. We have preserved for posterity the stories – and advice – of almost 1,200 men and women who lived through the harsh times of World War II. They witnessed hardships and triumphs; rejection and acceptance; hatred and love. Their lessons can help guide us as we embark upon our own voyages, in an equally complex world. All that it takes is sitting down, plugging in some headphones, and listening to their sage advice. One of the consistent themes that our beloved Nisei veterans always made sure to emphasize during their oral history interviews was not allowing the past – specifically their past, riddled with injustice– to repeat itself. The theme of the past being repeated finds itself manifested in many phrases, adages, and clichés, for good reason. This time, I wanted to change it up and share a specific quote that I came across while reading a poignant, touching essay written by a veteran of the 522nd Field Artillery Battalion, Tadashi Tojo. To provide some context, I want to note that Mr. Tojo wrote the essay about a singular incident during his experience as a member of the 522nd: coming across a satellite slave labor camp of the Dachau concentration camp in 1945. At that time, the 522nd had been detached from the 442nd Regimental Combat Team and was aiding in the Allies’ final push into southern Germany. During this campaign, Nisei soldiers from the 522nd stumbled upon the subcamp and found it abandoned by the German Army. The numerous accounts from the 522nd veterans all describe a horrific scene that demonstrated the most sickening depths that human beings could stoop to in order to torture and inflict suffering on others, simply for existing and living in a manner their oppressors did not deem fit. Many members of the 522nd also noted the irony in which a group of oppressed American soldiers of Japanese ancestry would help liberate a group of oppressed European Jews. These two quotes, considered simultaneously, paint an admittedly bleak picture of the world and humanity. The world, and our human existence, being cycles of inhumane acts is a bit of a pessimistic exaggeration. Instead, I like to think Mr. Tojo wrote these words more so as a reminder, a warning, and a call to action. Instead of observing this cycle of inhumanity as mere witnesses, Nisei veterans like Mr. Tadashi Tojo remind us to stand strong and simply do what is right and just. As we live in what can be an incredibly divisive world today, it can be difficult to exhibit the same courage and follow that lead. In order to break the cycle of injustice and inhumanity, however, it takes exceptional courage and conviction to follow through and act with purpose to show our fellow person compassion. Luckily, we have the Nisei soldiers, their stories, and their collective legacy to help serve as a reminder to act courageously in our daily lives, similar to the manner in which they did, and continue to do. In addition to our oral history interviews, Go For Broke National Education Center will unveil an exhibit, Defining Courage, in late May. This interactive exhibit will demonstrate that the courage displayed by the Nisei veterans is still meaningful and applicable to our contemporary society. This exhibit is proof that the words and actions of the Nisei veterans did not fall upon deaf ears. Lastly, I would like to circle back to Mr. Tojo and highlight his insightfulness and wisdom once more. In his oral history interview, Mr. Tojo takes the time to discuss his essay and he later segues to sharing additional thoughts brought on by discussing the quote from Eugene O’Neill. Mr. Tojo expressed his belief that in this world, individuals must take the care to show their fellow human beings compassion. He explains that his war experiences and the horrors that he had witnessed only made him certain of one thing: simply put, he does not know the solution to mending the fractured relationships that exist in the world. He does think, however, that finding inner peace, showing compassion to one’s fellow person, and acting considerately towards others are all positive, significant steps towards making the world a better place. Having the courage to follow this advice may seem difficult, but making a positive impact is rarely easy. The Nisei veterans have the reputation of being brave and humble patriots who tenaciously defended their country without a second thought to the hardship and sacrifice that lay ahead of them. Let us not forget, however, how wise these men are. Listening to the words from veterans such as Mr. Tadashi Tojo serves as a reminder that the legacy of the Nisei soldier is a rich, deep, and powerful story that demonstrates courage in all facets of life. That story of courage can help mold our present into a more united, compassionate future by reminding us of our past triumphs, along with our past mistakes.